Baritone-8, Acoustic Guitar from Taylor in the Baritone series. heads on fire's review"Sparkle! Thunder! Wow!" WOW. Taylor has really come up with something special here - this guitar is thunderous! It comes tuned from the factory down to B standard, 27 inch scale, and much thicker strings than normal, and it has an enormous low end register response. A very neat feature is that the 3rd and 4rd strings are not a single string, but a double course, akin to a 12-string. This makes any notes or chords played on the middle two strings shimmer and sparkle, adding depth and a natural chorusing effect to the sound. Being a high-end Taylor, the build quality is outrageously top-quality. The top is a spruce top for clarity, and the back and sides are Indian rosewood for depth and beauty. The Taylor Expression System translates the acoustic sounds into electric very well; all the power of the low end and all the sparkle of the mids and highs just jumps out of the guitar. All in all, this is one of the most original, unique, and inspiring new guitar ideas to come forward in a long time, and I would recommend that anyone that is a guitar fanatic at least try one out. The price will deter most, but anyone that can afford this baby would be very happy with it. Highly recommended - 10 out of 10. 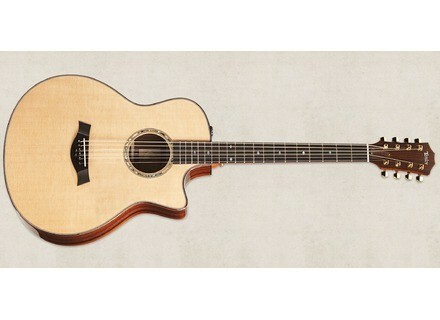 Taylor is presenting its new model of acoustic guitar, the Baritone 8 strings.